Building on the nationwide popularity of the Minimo range of folding mobility scooters, TGA launches a lighter mobility scooter the Minimo Plus for even greater levels of independence and transportablity. This latest version of the Minimo Plus is easier to lift, provides an upgraded driving experience and delivers additional safety. 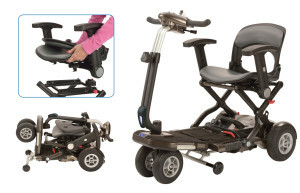 Its advanced lightweight design combines the compact size of the original Minimo with extra features normally only associated with larger, mid-range mobility scooters. This latest Plus model is easy to fold in a single, one-handed action and is ideally suited to storage in a car boot or for transit on buses, trains and planes.